Rev. 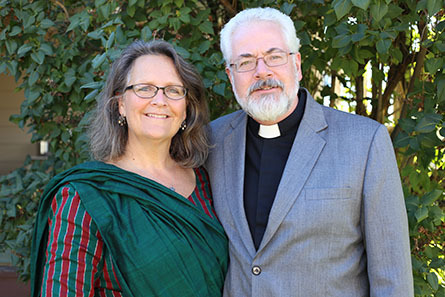 Roger and Amy James serve the Lord through The Lutheran Church—Missouri Synod (LCMS) in South Asia, where Roger serves as the area director for this part of Asia. Included in this area are Sri Lanka, India and Bangladesh. As area director, he oversees the LCMS mission work being done in designated countries. In addition, in Sri Lanka, Roger assists the Lanka Lutheran Church in raising up pastors and grounding congregations in Lutheran doctrine and practice. Roger is from Twin Falls, Idaho. He attended Valparaiso University before going on to earn his Master of Divinity from Concordia Seminary, St. Louis, and his Master of Sacred Theology from Concordia Theological Seminary, Fort Wayne. Before serving in Asia, Roger was pastor of Zion Lutheran Church in Marshall, Mich. Amy’s hometown is Parkers Prairie, Minn., and she has a bachelor’s degree in nursing from Mankato State University, Mankato, Minn. Amy worked in several hospitals before moving to Asia. Roger and Amy enjoy gardening, biking and hiking, and Amy also enjoys knitting, cooking and bird watching. Roger and Amy have four grown children and two grandsons, all living in the United States: Seth (married to Rachel); Kezia Nielsen (married to Aaron, with sons Clarence and Anders); John, a student at Hillsdale College, Hillsdale, Mich.; and Eli, a student at Concordia University Wisconsin, Mequon. Pray for Roger and Amy as they serve in South Asia. They ask for prayers for continued safe travel and good health for both of them. Ask God to grant them wisdom and fill them with joy as they live and serve in this part of the world. Pray also for their children and grandchildren living in the United States that God protects them as they are separated from them. Thanks be to God for Roger and Amy’s service to the South Asian people.